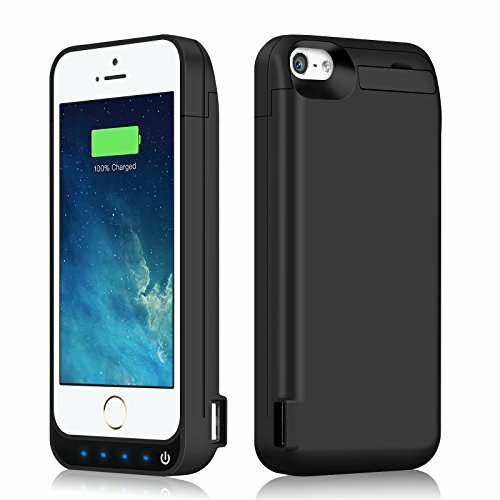 Please Note: This battery case is just fit for iPhone 5/5S/5C/SE. Creative Design. Enjoy your iphone 5/5S/5C/SE without removing the power case High class material to protect your iphone 5/5S/5C/SE. Charing and protection 2in1. Full Body Coverage for iphone 5/5S/5C/SE; Detachable Hard Case. iPosible iPhone 5/5S/5C/SE Battery Case, Make it Possible: Increase your battery power with this 4500mAh iPhone 5/5S/5C/SE battery charging case. A high capacity battery with up to 230% capacity of the standard battery for your iPhone. An excellent source of portable extra battery power, the External Battery Case for iphone 5/5S/5C/SE gives you more power to make it Possible. Compatible with iPhone 5S / 5C / SE / 5.The batteries use Grade A+ batteries with CE and RoHS certification. Internal chips also protect your smart phone from overheating, short-circuiting, over charging, and discharging! The iPhone 5/5S/5C/SE Battery Case Charger design Protecting and Charging 2in 1 makes sure that your phone will be protected from drops and impacts. If you have any questions about this product by iPosible, contact us by completing and submitting the form below. If you are looking for a specif part number, please include it with your message.